Architecturally designed and built with sustainable integrity this executive home, positioned on a generous 524m2, sets a benchmark in innovative design. From the polished timber floors to the industrial inspired style there is a seamless meld of organic finish that is perfectly balanced with the intellectual use of glass louvres, windows and oversized bi-fold doors. With a true North aspect the home is infused with an abundance of natural light and air-flow creating a relaxed and welcoming ambiance. Ascending the stairs from the entrance portal you arrive at the social hub of the home. Expansive open plan living with a private dining deck to the front of the home capturing glorious city views moves through to the kitchen and spills out to the alfresco living overlooking the level backyard, lush gardens and inviting pool. The kitchen is a masterpiece in functionality and creativity, an entertaining foodie's delight. With contemporary soft-close cabinetry, eye-catching stainless steel bench tops and suite of Miele appliances including coffee machine this space is vibrant and will draw you in. The luxurious master suite with sweeping views over Paddington features a fitted walk-in wardrobe and indulgent ensuite and is discreetly positioned on this level as is the guest powder room. On the lower level there are two queen size bedrooms, both with built-in wardrobes, and the main bathroom that offers you a unique picture-framed window view to the wine cellar. The media/rumpus room is also positioned on this level. 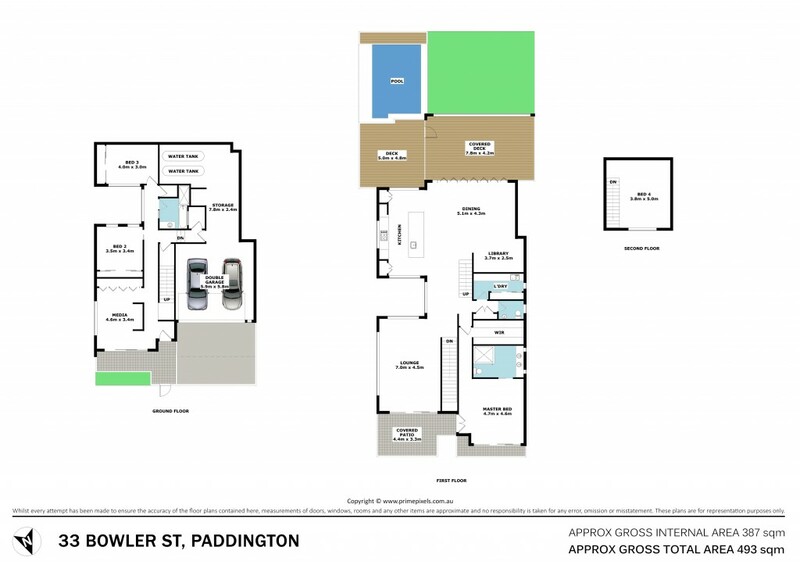 Walk to the vibrant Paddo cafe, dining and shopping precinct, take in a footy game at Suncorp Stadium, take a stroll into the City, or simply enjoy your new home. 33 Bowler Street is an extraordinary home offering you an exceptional lifestyle.